Sovereign Lake Nordic Club and Vernon can be very proud of the 8 athletes who recently traveled to Thunder Bay, Ontario to compete in the Cross Country Ski Nationals that took place March 10-17. These athletes train year round with this being the culminating event of the season. Despite being one of the smaller groups of athletes, this mighty and determined group of skiers displayed some excellent skiing and results over the week. The high school aged athletes train as part of the Snow Sports Academy, coached by Eric De Nys here in Vernon, while Hannah Mehain trains with the Okanagan Racers, a regional post-secondary team. 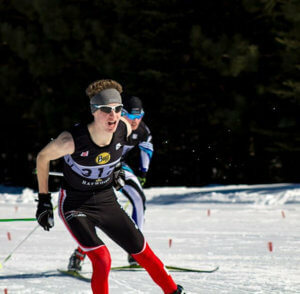 Torin Andrews on a warm day at Nationals in ThunderBay, Ontario. To kick off the week Clara Hardy and Hannah Stocker, a German exchange student who skis with the Academy, competed in the Team Sprint event making it to the semi-finals but not advancing. The next race, a classic technique interval start was part one of a two part, Pursuit style race which would take place over two separate days. Hannah Mehain took the gold in her category the first day, while others having strong finishes were Paige Latta, 11th, Lucas Sadesky 17th, Torin Andrews 25th, and Hannah Stocker 30th. Start positions for the second race were determined by the results from race one, with each racer starting behind the leader according to the amount of time behind they finished the previous race, yet now on a different course and distance, using a different technique. The ensuing excitement and scramble for position at the start of day two races in the close categories, where racers had literally finished tenths of seconds apart on day one, was nail biting to watch. In the second leg of the race Paige Latta finished an excellent 7th, Clara Hardy 17, and Lucas Sadesky a strong 12th, with teammate Torin Andrews 21st in their category. Other strong finishes were seen from Mehain, in 17th and Ian Oliphant 22nd. In the two day event Latta held onto 7th, Mehain finished 12th, and Sadesky 13th. Highlights from the very exciting Skate Sprint event, the second last event of the week, were Ian Oliphant taking 1st in the B final (7th overall), and Mehain with a bronze medal. The final event of the week was a longer distance classic technique race; Sovereign’s top skiers for that race were Mehain with another bronze, Latta 10th, and Sadesky 13th. Andrews showed great determination while having to ski a portion of that race with a broken pole. The excellent overall performance of these skiers was evidenced in how they stacked up in the coveted aggregates awarded by birth year at the conclusion of the week. After recently being awarded with the first place aggregate in BC, Lucas Sadesky was 2nd overall at the National level for 2003 boys, Torin Andrews followed closely in 4th, as well as 3rd in BC. Hannah Mehain added another 3rd place award in this category, as well as 1st in the College and University aggregate category, while Latta finished 6th nationally after receiving 1st in BC, Oliphant 13, while 1st in BC, Hardy 15, while 3rd in BC, and Madison Land 28. One more athlete, Danica Ariano, a local biathlete who also trains with the Ski Academy is attending her national event in Charlo, New Brunswick March 20-25-good luck to her!